We are currently updating parts of the web site for the new 2019 Season…. For Caravan, Camping and Pod Accommodation in St Davids, Pembrokeshire. 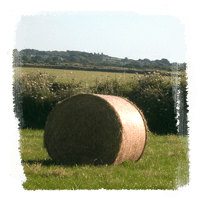 We are a traditional working farm and located about 3 miles from the historic Cathedral City of St. Davids and about 1.5 miles from Whitesands beach. The views from the site extend to Carnllidi and Penberry hills set in the stunning National Park scenery. The site is open from 28th of April to the middle of October (weather permitting!). We do allow dogs on site which must be kept on a lead. The Pembrokeshire Coast National Park can be easily accessed from the site. Rhosgadw is the ideal campsite for walking the Pembrokeshire Coast National Park, surfing holidays or just a quiet family break. We are also members of The Camping and Caravanning Club.